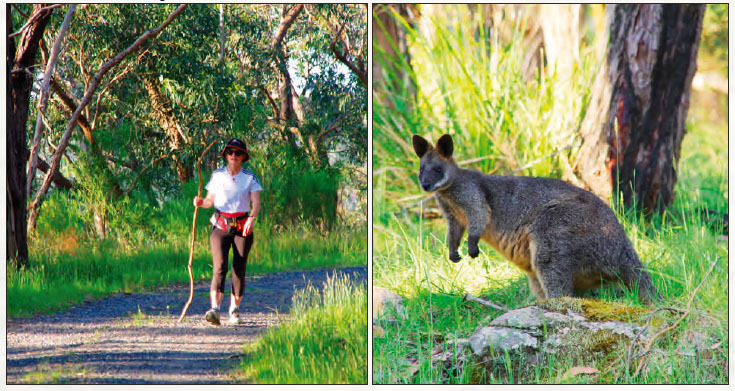 Gully News Issue 31 introduced a bushwalk around Ferntree Gully, with accompanying directions on the website. This issue offers a second walk, which I was pleased to road test with my friend. I am calling it the Wildlife Walk, for the simple reason that we saw so much wildlife at very close quarters: several black wallabies, scarlet-breasted king parrots and an echidna – all a stone’s throw from residential housing. We walked in the late afternoon light, which may have encouraged these sightings. Like the first, this walk takes approximately two hours of steady walking. The route climbs and descends steeply through the National Park above Ferntree Gully and at times requires cautious walking, considered footwear and drinking water. But the views and bushland escape are worth the effort. You can download a detailed, timed route here. Starting at the cemetery gates at the corner of Forest and Underwood Roads, walk south along Forest Rd 440 metres to Butlers Rd and the start of Peregrine Estate. Walk east up Butlers Rd to where it turns right to become Lady’s Walk. Follow this gravel road for 300 metres as it climbs along the ridge of the former quarry until you reach a hairpin bend, with a lone house and signposted gate into Boulevard Track of the national park. Take Boulevard Track, doubling back and upwards for a long straight stretch of almost a kilometre. At the top, the track circles around to meet the junctions of Feather and Lantern Tracks. Stay on Boulevard, now descending for 500 metres to the junction of Belview Terrace Track. Turn right into Belview Terrace, also steeply descending and winding downwards to the entrance of the National Park at the start of the Tourist Rd. Turn right to join a rough bike and walking track running parallel and above the highway, fire station and Upper Ferntree Gully railway station. through the town to the start at the cemetery. We thoroughly enjoyed this walk, challenging as it was, for its enveloping bush, view points and astounding encounters with wildlife. We are very lucky to live on the doorstep of such natural beauty.